Tour of Zelienople | Visit Butler County Pennsylvania! 343 S. Main Street - The first stop is the Passavant House, where you’ll learn about the naming of Zelienople and other local history. Don’t miss the framed art made of human hair! Continue to Buhl House, Zelienople Historical Society’s other house museum. This is where you can discover why the town got its name! 219 S. Main Street - If you plan on biking during your Butler County stay, visit Dapper Bicycle for accessories, service or even a new bike. 210 S. Main Street - Stop when you see a giant foot print on a building. ShuBrew: Handcrafted Ales & Food serves up beers named after footwear in what might be PA’s smallest brewery! 205 S. Main St. – Just a few steps off of Main Street, visit Spring Street Café for a gourmet coffee or snack to keep you going throughout the rest of your walk down Main Street. We love the orange truffle mocha! 142 S. Main Street - Carol’s Pastry Shop has been in business for 40 years. You will definitely want to try a Bear Claw, they’re some of the best in the area! 125 S. Main Street - Stocking Stuffers Plus is a shop for all seasons. Candles, framed prints, local sports items and all-around great finds to decorate your home. 122 N. Main Street – Family-owned since 1947, Mathew Jewelers specialize in quality jewelry and expert repair is done on premises. 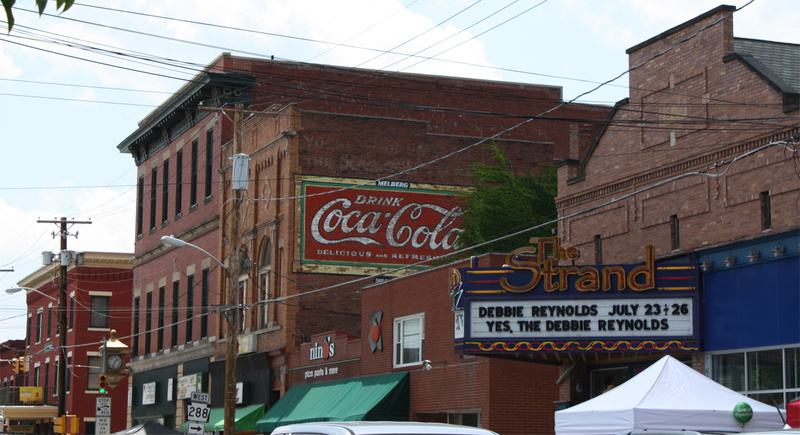 119 N. Main Street - The Strand Theater, a former movie and vaudeville theater, celebrated its grand reopening in July 2009 and put on its first full-length musical production in October 2014! Check ahead to see what shows are running. 124 N. Main Street – Enjoy pizza, pasta and other flavorful dishes at Goodfellos Pizza, Pasta and Grille. 310 E. Grandview Avenue – Stop by our office and grab some brochures for other treasures in Butler County. We’ll be here to greet you Monday-Friday, 8:30-4:30. 141 Zehner School Rd., Suite 300 – BounceU Where Birthday Parties come to life. We specializing in private parties. Two climate-controlled rooms filled with giant inflatables. We have scheduled open bounce sessions for the public. 180 Tomlinson Dr. – Get Air Pittsburgh Trampoline Park features wall-to-wall trampolines, foam pits, dodge-ball and a ninja obstacle course. Party Room packages available! 519 U.S. Route 19 – Feel like a kid in a candy shop, literally at Baldinger’s Market. Old fashioned and bulk candies will take you back to your childhood. Don’t miss Mazza Vineyards’ outlet with a great selection of wines inside the market! 420 S. Main Street – Grab a custom screen printed or embroidered shirt to remember your trip to Zelienople at The T-SHIRT Loft. They also have Steelers merchandise available. 70 W. Beaver Road – Fun for adults and kids alike, Glade Run Adventures provides unique learning experiences including summer camps, riding lessons, and special events designed to spend time with our animals and horticulture in the great outdoors. 150 Magill Road – Award-winning smoked meats and the American Association of Meat Processors #1 beef jerky can be purchased at Herb Brittner’s Smokehouse.